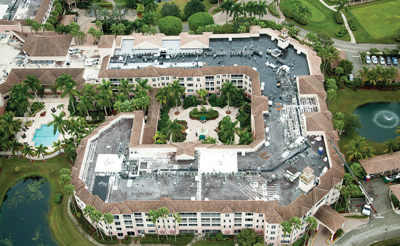 In 2014, Advanced Roofing, Inc. (ARI) re-roofed the Devonshire residences in Palm Beach Gardens, FL. Nestled on 26 picturesque acres within the prestigious PGA National Resort & Spa, Devonshire is Palm Beach Gardens’ premier address for catered retirement living. The property, whose residents include mostly high net worth seniors, consists of three buildings built in the 1990s: Courts (45,900 square feet), Cove (51,000 square feet), and Copley (39,700 square feet). Devonshire was purchased in 2013 by Erickson Living, an American operator and developer of retirement communities. While performing a review of the property, the owners discovered many issues to the existing roof system that demanded immediate attention. Because there were many air conditioning units located on the roof at Devonshire that were frequently serviced over time, it caused the roof system to deteriorate faster than normal. At the end of its service life, temporary fixes were made, including patches and coatings. However, these constant repairs were increasing the operational budget while the issues remained unresolved. The roofing system was at risk of eventual failure that could potentially close the building, leaving the elderly residents without a home. To begin the project, the existing leaks were stopped at the Cove building followed by a complete tear-off and roof replacement. ARI selected a high-performance, SOPREMA three-ply modified bitumen roof and new ALSAN Flashing systems that would satisfy Devonshire’s needs for high foot traffic while satisfying their performance and budget needs. Utilizing many of its in-house divisions on this project, ARI was able to streamline production and costs by acting as a single source contractor. The Sheet Metal Division fabricated and installed new roof vents and expansion joints. Additionally, the Waterproofing Division repaired cracks in the walls and installed a new SOPREMA waterproofing system to stop water from entering through the building envelope. ted. To accomplish this goal, a late daily start time was issued and schedules were adjusted during the holidays to allow extended and uninterrupted family time for tenants. By using alternative routes for workers to access the inside of buildings, the need for additional floor protection that may have caused further inconveni-ences and hazards to tenants was prevented. Furthermore, to ensure traffic flow throughout the project, the crane and trash hoppers were staged in locations around the property that would cause minimal disruptions to the tenants and staff. “ARI’s communication throughout the project was great. There were minimal disruptions to the tenants and staff due to the team having daily progress meetings and mitigating issues with our team beforehand,” said CBRE Project Manager Matt Kiziah. By working together with the property owner to address the unique needs of their residents while providing a roofing solution that corrected past issues, the project was completed on time, on budget, all while exceeding the client’s expectations. Following completion of the original Cove project, ARI was hired to re-roof the Cove Buildings. Marketing Manager for Advanced Roofing, Inc.
Bill Arseneau is the Marketing Manager for Advanced Roofing, Inc. (ARI), an award-winning diversified construction company specializing in re-roofing occupied commercial and industrial buildings in Florida and the Caribbean with offices in Ft. Lauderdale, Jupiter/ Palm Beach, Miami, Orlando/ Sanford, and Tampa, FL. 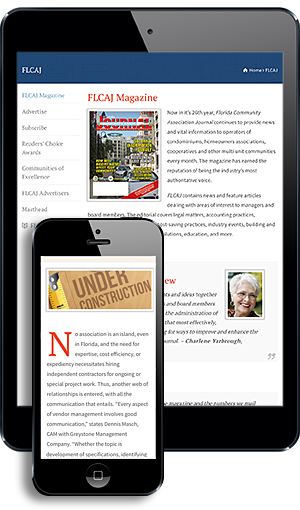 Established in 1983, Advanced Roofing ranks as the top commercial re-roofing contractor in the state of Florida by Roofing Contractor Magazine and the South Florida Business Journal. For more information about Advanced Roofing’s award-winning commercial roofing solutions for condominiums, visit www.advancedroofing.com.